School’s Out for Summer, and Combat City is a fun location for ‘Fortnite’ style tactical laser tag and a real karting experience. If you are looking for fast paced competitive fun for all the family over the school summer holidays in Glasgow and Dundee, make tracks to ScotKart & Combat City. We have 2 great locations in Cambuslang and Dundee offering you next generation tactical laser combat, offering mission based play, similar to paintball or airsoft, but without the bruises. The Cambuslang centre, only 10 minutes by car from Glasgow City Centre, offers you 2 huge outdoor arenas, over 20 covered buildings, artificial turf, and is rated a 5 Star Visit Scotland Activity Centre. The Dundee centre, just off the Kingsway ring road, offers you one of the largest laser combat experiences in the U.K, and is housed within ScotKart Indoor Karting. ScotKart offers you the latest pro-karts for teens and adults, and cadet karts for ages 8+. These are not heavy weight electric go karts which are no fun to drive, but lightweight, highly responsive, racing karts which are immensely rewarding and thrilling to race. Every afternoon Mon-Fri your party can enjoy 2 timed karting sessions and 30 minutes of laser tag or laser combat for only £25pp. T&C Offer subject to availability and cannot be combined with any other offer. 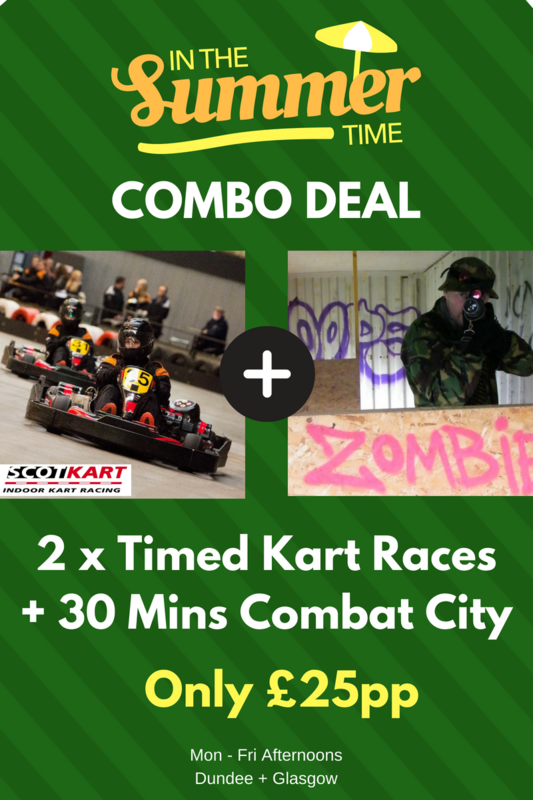 The combo deal applies to cadet (age 8+), family and regular karting sessions (age 12+/adult), but the earliest laser tag session will be at 12noon. Offer valid until August 23rd, 2018. The laser tag session must be taken on the same day and is not transferable to another person. Last registration is 4pm, note that either the laser tag or karting might be first, depending on bookings. A headsock is required by all drivers, available at reception for only £2 and can be reused.